Pearl Jam frontman Eddie Vedder dedicated a song to Gord Downie and The Tragically Hip during the band’s first of two nights at Wrigley Field in Chicago, IL on Saturday. 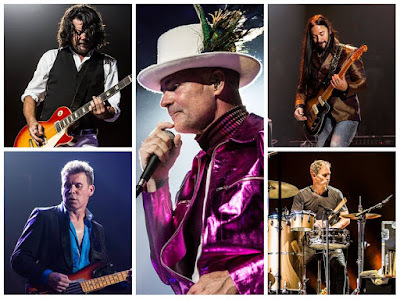 The tribute came as the Canadian band performed a farewell concert that was broadcast nationwide from their hometown of Kingston, ON as the last show of a tour following news in May that Downie had been diagnosed with terminal brain cancer. “And I got to spend a few days with him,” continued the singer, “and we were all informed of some sad news that he had a really tough form of brain cancer called Glioblastoma, which some of us know a lot about and it’s a tough one, if not one of the toughest forms. And he was very courageous and decided to take his group out on one last tour and tonight’s the last night of that run. Pearl Jam then performed the single, “Light Years,” from 2000’s “Binaural”, a track about the death of someone close. Downie's cancer was discovered last December after a seizure led to an emergency room visit in Kingston. Doctors at the Sunnybrook Health Sciences Centre in Toronto were able to surgically “excise the bulk of the tumour”, following which the singer underwent radiation and chemotherapy treatments earlier this year. The month-long 15-date run across Canada in support of their latest album, “Man Machine Poem”, kicked off in Victoria, BC on July 22, with a portion of the proceeds to be donated to the Sunnybrook Foundation.